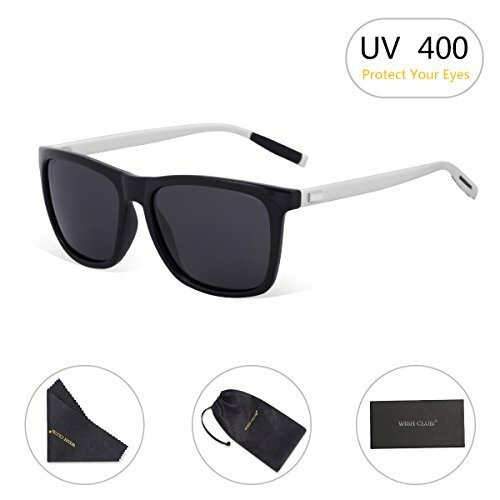 POLARIZED LENS - 100% UV400 protection coating, blocks 100% harmful UVA & UVB radiation. Restore true color, eliminate reflected light and scattered light and protect eyes perfectly.Provide a high clarity vision in front of you to see clearly and more comfortable. OCCASION - Reduce glare reflected off of roads, bodies of water, snow, and other horizontal surfaces. Restore true color, eliminate reflected light and scattered light and protect eyes perfectly. Polarized sunglasses cut glare and haze, so your eyes are more comfortable and you can see better. The sunglasses designed for driving, running, fishing, racing, skiing, climbing, trekking, etc. ALUMINUM MAGNESIUM FRAME - Polarized Sunglasses used Aluminum-magesium alloy makes the frame more durable and sturdy. Because of Skin-friendly nose pads ,it give you softable feeling for wearing. Guarantee - All WISH CLUB Polarized Sunglasses comes with a 1 year warranty on frames and lens as well as a 30 Day Money Back Guarantee when purchased from authorized dealers. So if you are not completely happy with your purchase for whatever reason, let us know and we will provide you the best service!